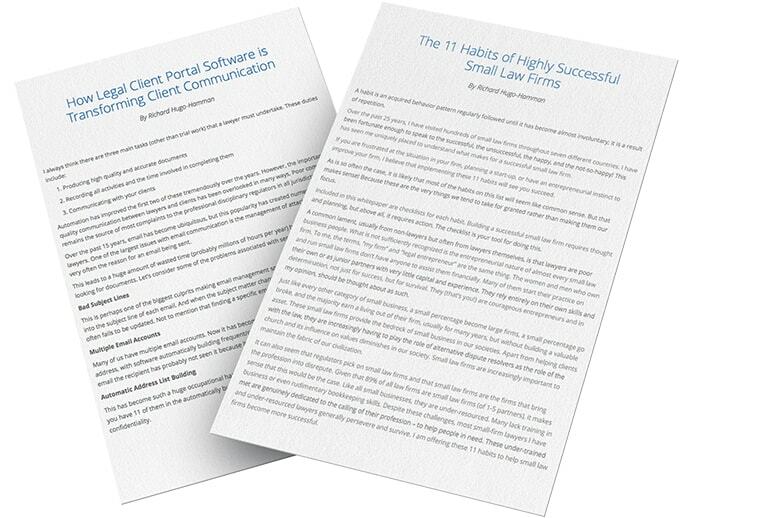 Discover the 11 Habits of how you can build a successful small law firm. Learn how attorneys are increasing their billings by 30% when switching to an automated online time recording system. What are the 4 foundation stones of every successful law firm? Discover the 4 key elements law firms need to excel. Learn how LawConnect can help attorneys share documents with their clients quickly, securely, and collaboratively. Do you know how to create long-term growth for your practice? Read more to discover how to achieve healthy stability. Underestimating cash flow is the most common mistake of self-starting attorneys. Learn how to build your practice fast, without going broke. How can you work less and increase the revenue of your law firm simultaneously? Discover four simple steps to transformation. Find out how to overcome the 5 biggest challenges facing your law firm today. The small law firm market is competitive. Have you considered technology to give your firm an advantage? Learn how to invest in technology and provide your existing staff with the tools to increase efficiency. Small law firms’ growth is constrained by a lack of resources. Find out how groundbreaking technology is an answer to this deficiency. Is Your Firm Still the Firm of 2001? Is your law firm still stuck in the status quo? Learn how you can be the law firm of the future. A law office stacked with paper folders cannot meet the demands of today. It’s time to learn how to move your firm into the 21st century with 5 practical tips. When your matter is always accessible on every device, you’re free to work anywhere, anytime. Read about the pros and cons of managing your law practice in the cloud. Learn how to become a legal innovator and create new ways to structure your law firm to meet the demands of a tech-savvy world. Discover how to organize your law firm with a modern system, so that it will be worth more than one with a 20-year old system.